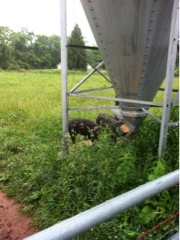 Early yesterday morning Homer was headed through the big gate on the farm and was met by a pair of pigs. Right there by the gate, cleaning up under the feed bin. Normally both these pigs are in the biggest pen inside the fence around the hoophouse. They skipped the vegetables, poultry, beehives, compost pile and everything else and were up by the road. He wrangled them back into an area surrounded by electric fencing. They seem happy enough and are away from the road. 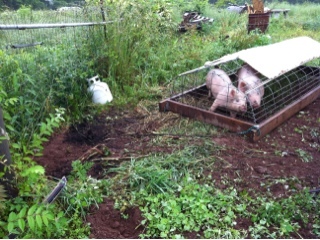 Then another pair of pigs, in a smaller pen, moved themselves over and ate every bit of the recently planted rhubarb. Today...lets be where we are supposed to be. Behave yourselves, please.